Please Note: We do not raise Nebraskans, As far as I know they are no longer in existence in the USA today. If you know of anybody raising or have seen them in the US please let us know. Here is an article that was published in "Turkey World" magazine in 1950. Here is more info on the Nebraskan variety by V.S. Asmundson. Day old poults of the Nebraskan variety have white down with a brown head spot or spots. The first plumage is white, the second or juvenile plumage has black pigment scattered through it and the amount of pigment is apparently increased in the adult plumage although none of the feathers are completely black. The amount of pigmentation in plumage on different parts of the bird varies, as it does typically on many color varieties of this species, there being more pigment in the plumage on the neck,back and part of the wings than on other parts of the bird. 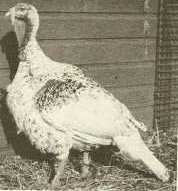 Matings of Nebraskan birds produced only spotted progeny, while matings of Nebraskan males with bronze hens and with brown produced only bronze pattern progeny. The plumage color of the Nebraskan variety of turkeys is determined by an autosomal gene, which may be designated sp, recessive to non-spotting or solid color such as found in the bronze. The sp gene appears to be the only one determining the differences between the plumage color of the Nebraskan and the bronze varieties. The genotype would be b+b+ spsp, bronze based with the spotting gene mutation.